If you’ve had a healthcare appointment lately, you may have heard your healthcare provider mention your “A1C level”. So, what’s that mean, exactly? How does that affect my health? The ADA says that for people with diabetes (who aren’t pregnant) who are managing blood sugars with oral medications or insulin, a reasonable goal is to have an A1C of less than 7%.1 Some healthcare providers may suggest a higher or lower goal based on your individual medical history. Is it an accurate picture of my blood sugar? 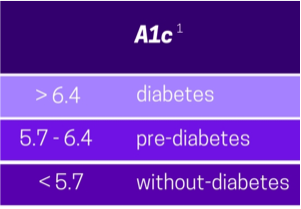 Secondly, since A1C only gives a 3-month average, it doesn’t show how much of a roller coaster your blood sugar has been on in between meals, and the amount of time out of range of your minimum and maximum blood sugar levels your body has had to endure. 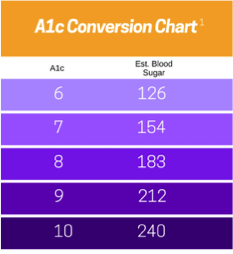 Ideally, an A1C measurement can be used in combination with the blood sugar results on your meter to give you and your healthcare provider a real-life picture of your diabetes.